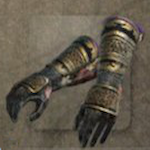 Master Swordsman's Armour: Kote is a Arm Guard available in Nioh. "Kote of the "moro-gote" type, covering both the left and right arms, and designed more for close-quarters combat than archery. This heavy armour belonged to Ashikaga Yoshitetu, the 13th Shogun of the Muromachi Shogunate. Yoshiteru was a famous swordsman taught by Tsukahara Bokuden who sought to revive the shogunate, taking him into battle against the Miyoshi clan. He was killed before fulfilling his dream. This heavy armour was a treasure of the Ashikaga clan for many years, being passed down through the generations since Takauji. It has vivid, multi—coloured lacing. Using the very finest steel and high quality leather, it affords a level of protection that belies its old—fashioned, gaudy appearance." Forged using the Exotic Forging Material, Kappa Shell. This Armour is worn by Ashikaga Yoshiteru and is part of the Master Swordsman's Power Equipment Set which focuses on Dual-Swords.